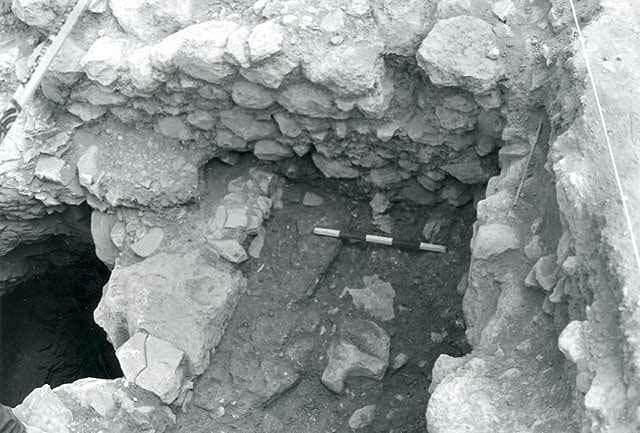 During July 2003 a salvage excavation was conducted along the eastern slope of the Na‘ura village, descending toward Nahal Na‘ura (Permit No. A-3956*; map ref. NIG 2374/7245; OIG 1874/2245) after ancient remains were exposed when preparing for construction. The excavation, on behalf of the Antiquities Authority, was directed by E. Amos, with the assistance of V. Essman and V. Pirsky (surveying), E.J. Stern (pottery reading) and H. Tahan (pottery drawing). 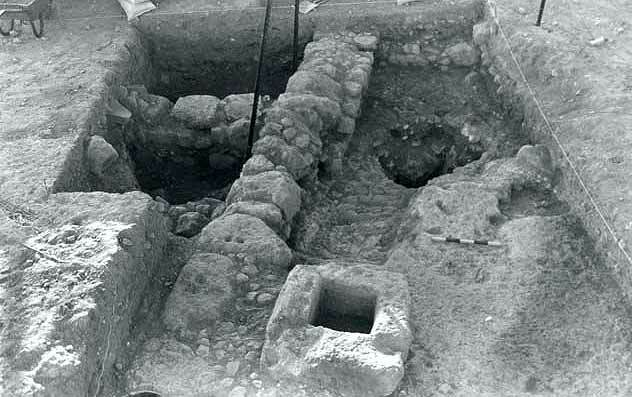 A single square was opened (5.0 × 5.3 m), revealing three strata that comprised building remains and a bell-shaped pit from the Umayyad and Abbasid periods (Figs. 1, 2). The opening of a bell-shaped pit was uncovered at the eastern end of a bedrock terrace that descends sharply to the east (bottom diam. 6 m, depth 6.5 m). The western side of the pit’s opening was c. 1 m higher than its eastern side because of the precipitous slope. The pit’s walls were coated with plaster; in the western wall, 1.1 m below the top of the pit, was a hewn aperture that led to a niche (2 × 3 m). In the niche’s northern wall was an aperture (0.5 × 0.8 m) blocked by stones. The pit and the niche were not excavated; therefore, their use or dating could not be determined. A wall (W4) preserved a single course high (Fig. 3), whose western side faced the inside of the pit, was built on the lower eastern rim of the pit’s opening. The wall was probably intended to raise lower eastern rim of the pit to that of the western one. The ceramic finds were scant and mostly included ribbed body fragments that probably dated to the end of the Byzantine and the Umayyad periods (seventh–eighth centuries CE). Stratum II. Two phases were discerned. In the earlier phase (IIb) Wall 4 was dismantled down to its bottom course and Wall 1 was built above it, oriented east–west and c. 0.3 m north of the pit’s opening (Fig. 4). The wall was built of large fieldstones with smaller ones between them. 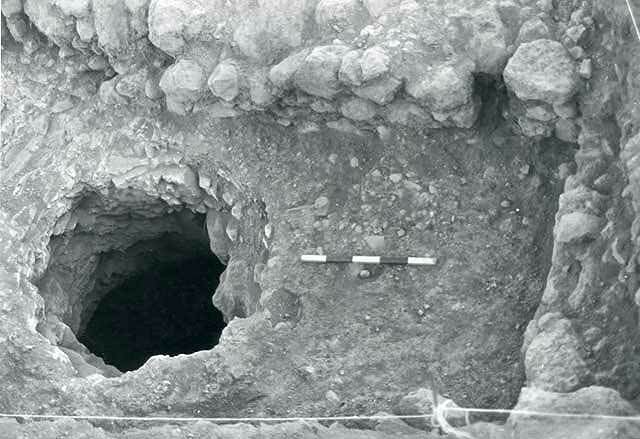 The area south of the wall and east of the pit’s opening was filled with a thick layer of soil (L113; Fig. 5) that contained animal bones and potsherds that dated to the Umayyad and the beginning of the Abbasid periods (eighth century CE). This layer reached the height of bedrock west of the pit. It seems that the pit was no longer used in this phase because its opening was blocked by large fieldstones. Another wall (W3) was built in the later phase (IIa). It was oriented north–south at the eastern end of W1 and formed a corner with it. 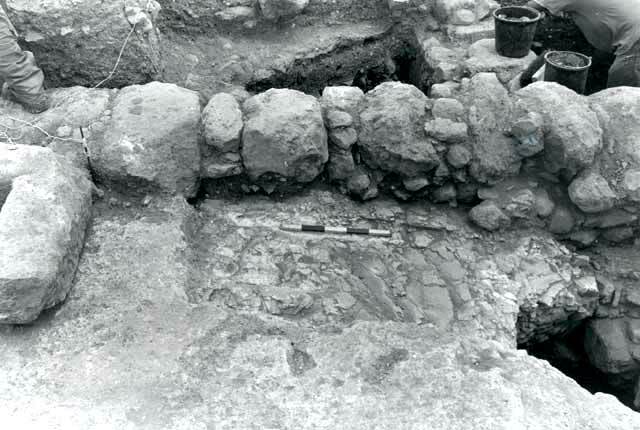 West of W3 was a floor (L108) of small and medium fieldstones set on a bed of small stones, overlying the layer of soil fill (L113) that was probably intended to raise the eastern side of the building. The bedding of the floor was dated to the Umayyad and the beginning of the Abbasid periods (eighth century CE), based on the potsherds that included a gray jar (Fig. 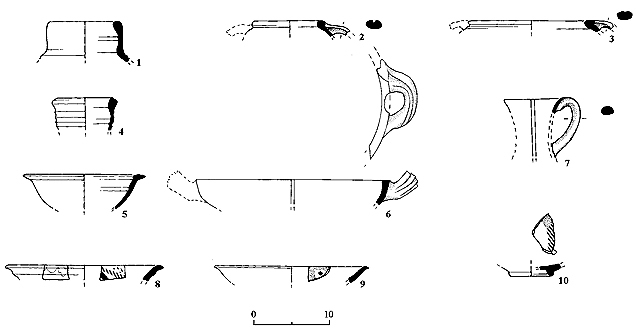 6:1) and body fragments of ‘Fine Byzantine Ware’. 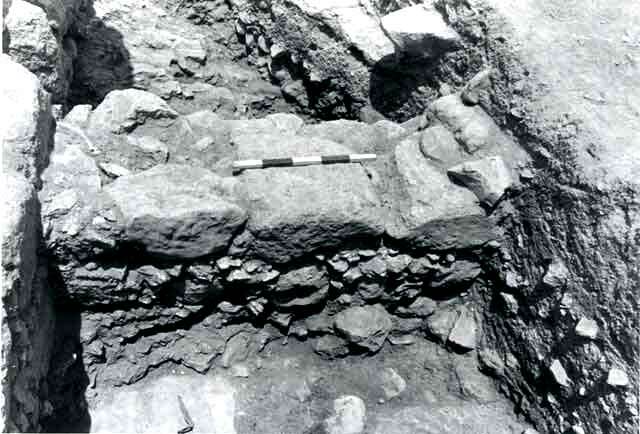 The fieldstone floor and the bedrock surface west of the pit’s opening were covered with a thick plaster layer (L106). At the western end of W1, c. 2 m west of the pit’s opening and where bedrock is high, was the capstone of a well (0.4 × 0.8 × 0.95 m) in secondary use. The stone had a rectangular aperture (0.3 × 0.4 m) in the center and a depression on one of its corners with a narrow channel that extended to the opening. The depression was probably used to place a storage vessel. The capstone was found lying on top L106 and next to the southern face of W1 (Fig. 7). The capstone was part of an installation that consisted of a layer of plaster mixed with small stones and potsherds and apparently, it was originally positioned on the bell-shaped pit (Stratum III). North of W1 and perpendicular to it was Wall 2, which was built on bedrock, aligned north–south (Fig. 8) and preserved c. 0.8 m high. 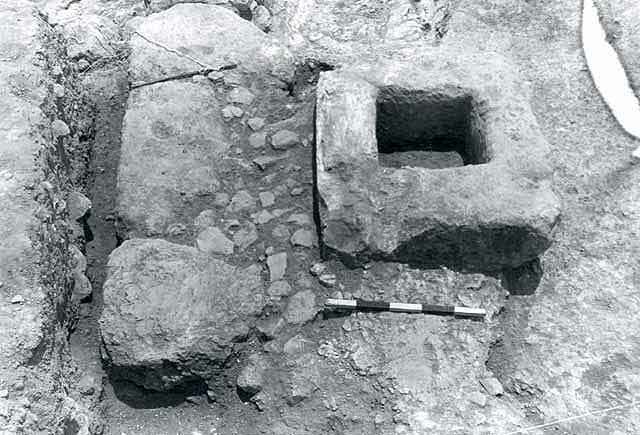 West of W2 was a tabun and a fieldstone pavement (L110), overlaid with potsherds, including two cooking pots (Fig. 6:2, 3), which dated to the Umayyad and the beginning of the Abbasid periods (eighth century CE). The ceramic finds were similar to those found in the bedding of the stone floor (L108), to the west of W3. East of W2 was an accumulation of soil that extended from bedrock surface to the height of the surviving top of the wall. The ceramic finds recovered from the fill also dated to the Umayyad and the beginning of the Abbasid periods, similar to those found west of the wall, including a jar of light colored clay (Fig. 6:4), a bowl (Fig. 6:5) and a cooking krater (Fig. 6:6), as well as a Byzantine follis (IAA No. 111611) from the time of Justin I (518–527 CE) that was minted in Nicomedia. following the abandonment of the Stratum II building, the area was covered with a thick layer (0.2 m) of tamped soil that contained plaster, small stones and small potsherds. This layer (L102) contained potsherds from the eighth–ninth centuries CE, including a jug of light colored clay (Fig. 6:7), a glazed bowl with green and brown stripes (Fig. 6:8) and two glazed bowls with splashed yellow and green paint (Fig. 6:9, 10). It seems that the region was not built-up in this period; rather, the area was open and may possibly have been used as a threshing floor. No subsequent activity was recorded in this area until a layer of alluvium that included among others, potsherds from the twelfth–thirteenth centuries CE, had accumulated. 2. The excavation, looking east. 3. Wall 4; in background, Wall 1, looking north. 4. Wall 1, looking north. 5. Locus 113, looking east. 7. Capstone next to Wall 1, looking east. 8. Wall 2, looking west.